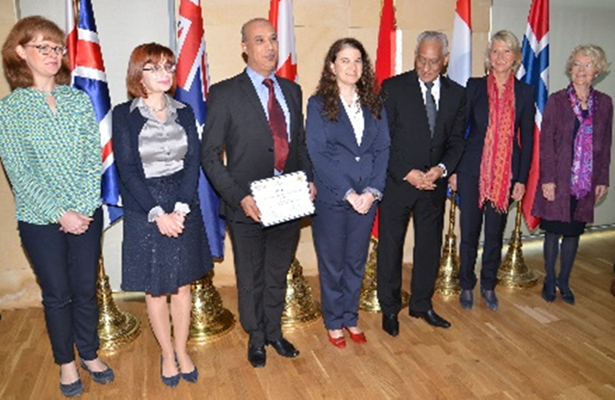 The Moroccan Délégation générale à l’administration pénitentiaire et à la reinsertion (DGAPR) hosted a trainer certification ceremony at its headquarters in partnership with the Global Center. The ceremony marked the certification of 22 trainers from five administrative regions in Morocco (Fes-Meknes, Rabat-Sale-Kenitra, Casablanca-Settat, Marrakesh Safi, and Beni Mellal Khenifra), who are now ready to deliver a one-day awareness raising course on preventing and countering violent extremism in prisons across the country. It was officiated by high ranking officials from the DGAPR, including the Delegate General and the director of the National Training Academy, ambassadors of donor countries, and the executive director of the Global Center. The certified trainers were shortlisted through a DGAPR recruitment process that attracted hundreds of internal applicants. Following several rounds of rigorous training, applied practice workshops, monitoring, and evaluation, the Global Center and DGAPR experts selected 22 deserving applicants for training certification. These trainers will implement instructional courses in their respective regions to colleagues, ensuring that prison staff improve competence and confidence on issues related to violent extremism in prisons. With support from the United Kingdom, regional trainers are now equipped with projectors, laptops, and digital training materials to facilitate courses away from central and regional headquarters. Since 2016 the Global Center has partnered with DGAPR and its National Training Academy to develop, deliver, monitor and evaluate a series of staff training programs on managing terrorism offenders and identifying and addressing radicalization and recruitment to violent extremism in prisons in the Kingdom of Morocco. These activities form part of the Global Center’s Countering Violent Extremism in Prisons (CVE-P) program, tailored versions of which are also implemented in Indonesia and Kenya. The CVE-P Program is supported by the governments of the United Kingdom, Canada, The Netherlands, Australia, Norway, and New Zealand.